EAN 8 barcode is derived from EAN 13 code (European Article Number). 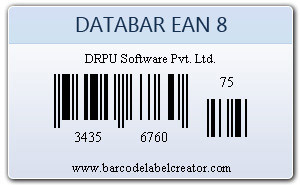 Data bar EAN-8 bar code is used on small packages. 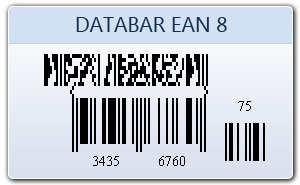 EAN-8 code is also known as UPC-8, GS1-8 and GTIN-8 barcodes. This bar code symbology can encode GTIN-8 number from GS1 system. To create high resolution linear and 2D barcodes labels, tags and stickers using effective barcode generator software. Bar coding system can design all type of bar codes labels for different commercial or non commercial business organization.